Carl Yastrzemski (born August 22, 1939) was a professional American baseball player. He had an excellent 23-year career, playing only for the Boston Red Sox. Primarily a left fielder, he played some first base and designated hitter as he aged. Known as "Yaz", his career began in 1961. His first two years are viewed as being solid but not spectacular, but in 1963 he won the American League batting championship with a batting average of .321. His best year was in 1967, when he won the American League Triple Crown, with an average of .326, 44 home runs and 126 rbi. He is the last player to have won the triple crown. He was voted Most Valuable Player, almost unanimously (one voter inexplicably chose Cesar Tovar of the Twins). 1967 was the season of the "Impossible Dream" for the Red Sox, who rebounded from a ninth-place finish in 1966 to win the American League pennant. Fulfilling the Curse of the Bambino, the Red Sox fell 4 games to 3 in the World Series to the St. Louis Cardinals, losing three times to Bob Gibson. In 1968, "Yaz" won the batting championship again, with an average of .301, the lowest average of any batting champion in major league history. He had many more strong seasons, consistently finishing in the top ten in the league in many statistical categories. Yastrzemski and the Red Sox would suffer another World Series loss in 1975, losing 4 games to 3 to the Cincinnati Reds. Yaz was the final out in game 7, trailing by one run. He retired in 1983, at the age of 44. No player has had a longer career with only one team. His final career statistics include 3308 games played (second all-time), 452 home runs, 1844 rbi, and a batting average of .285. He had 1845 walks in his career, sixth all-time. 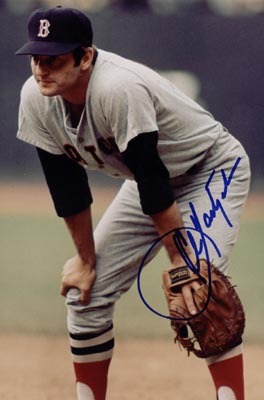 Yastrzemski was a star defensive player, winning seven Gold Glove awards in his career. One of the top players of his era, he was elected to the United States Baseball Hall of Fame in his first year of eligibility, with the support of 94% of voters.